The Golden Argosy – Check the book out from the Open Library for free. Charles Grayson was an editor of Stephen King’s favorite book The Golden Argosy. Besides being an editor of anthologies, Charles Grayson was a novelist,and screenwriter who went to Hollywood and wrote screen plays during the 1930’s, 1940’s, and 1950’s . Charles Grayson was a pseudonym. Early on in his writing career, he wrote under his name, Charles Wright Gray, and compiled an earlier anthology of short stories titled Hosses for the same publisher, Garden City Publishing, who published Stories for Men. Another very early anthology of animal stories, Dawgs, was published in 1925. In 1927, the Kappa Sigma publication Caduceus wrote “Bernard F. Scotten of Los Angeles suggests Charles Wright Gray (Los Angeles ’26) author. Although still a very young man,” he writes, “Bro. Gray has published four books of fiction, with two more scheduled for release early in the coming year. His publishers are Henry Holt and Company of New York.” In this publication, Caduceus Volume 43 issue 1, there is photo of a young Charles Gray next to a Art White “winning the attendance cup for Delta-Nu”. Like many young writers of the 1920s, Charles Grayson went to Hollywood to cash in. Writing for the movies was one of the few high paying writing jobs that could be found after the onset of the Great Depression. While working, Charles kept on publishing anthologies because he loved great writing and had a knack for editing. But after the 1950’s, there isn’t anything I can find published or credited to Charles Grayson although he lived until 1973. This is the case for many Hollywood screenwriters in the fifties. By then, the old Hollywood system and the Golden Age of Hollywood had ended. Charles Grayson put together several anthologies with writers from the late 1920’s through the 1940’s. In Rivkin’s book Hello Hollywood! you can find a short piece by Charles Grayson called On Location. The story revolves around director John Huston on the set of The Barbarian and the Geisha (1958). Hello Hollywood! is an anthology of stories about Hollywood with such writers as Horace McCoy who contributed a 1936 story previously published in the Hollywood Reporter titled I Wish I was a Writer for the anthology. 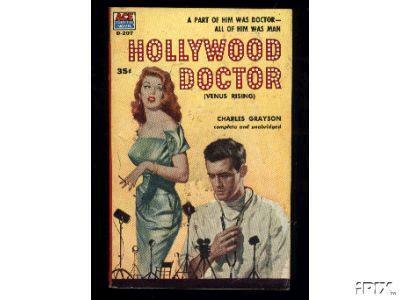 I also found additional works by Charles Grayson such as Hollywood Doctor. Other screenwriters too, like P.J. Wolfson‘s Is my Flesh of Brass? aka The Flesh Baron, tried to jump on the success of the doctor genre in the mid-fifties. Tastes were changing and there was a dearth of new writers as paperback sales took off after WWII. Paperbacks have an interesting history and you can read a short one here. Many of the authors in the anthologies wrote between the late 1920’s and early 1950’s. With Prohibition, The Great Depression, WWII, Red Scare, and the emergent of new media forms, it was an interesting time. While paperback mass consumption was taking off, television still had a ways to go before it started to take a good chunk out of our leisure time. Unfortunately, the demise of the studio system and the Hollywood blacklist ended a lot of Hollywood writer careers in the 1950’s. It is interesting that Charles Grayson is credited as a screenwriter for I Married a Communist aka The Woman on Pier 13 shot in the classic film noir style by Nicholas Muscara in 1949.